more work needs to be done to understand this proxy. This is a public domain image from Wikipedia. Dr Barry Lomax and Prof Melanie Leng are isotope geochemists who work on understanding how the isotopic composition of environmental materials can tell us about past environments. Here they blog about their new paper, available via open access in the premiere geochemistry journal (Geochimica et Cosmochimica Acta), co-authored by Dr Janice Lake and Dr Phillip Jardine on the use of carbon isotopes in plant materials to predict atmospheric CO2. The paper sets out to test this relationship to determine if it could be used as a tool for estimating changes in atmospheric CO2 concentrations through geological time. 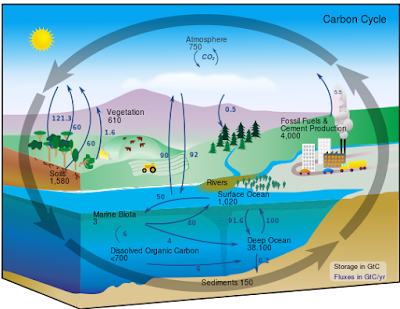 Understanding both the long term carbon cycle and rapid perturbations in atmospheric CO2 observed through the geological record has become increasingly important as we enter a period of human induced carbon cycle variations especially the rapidly increasing atmospheric CO2. A major limiting step in understanding the climate system sensitivity to changes in atmospheric CO2 over geological time has been the variability in modelled solutions of “palaeo-CO2” concentration which vary considerably between different types of modelling solutions. To validate estimates of past CO2 we need CO2 proxies, those currently most commonly used include the study of the numbers of stomata in fossil leaves, or the carbon isotope chemistry of fossil organisms. The carbon isotope composition of fossil plant material is thought to provide a direct measure of the past atmospheric CO2 concentrations through geological time, however there is extensive scientific controversy and debate in the literature. We set about to validate this approach which if successful would allow us to assess changes in amount of CO2 in the atmosphere from the dawn of vascular plants in the Lower Palaeozoic which would help us predict the responses of modern plants to changing CO2 concentrations. From a physiological standpoint changes in carbon isotope composition of plant tissue is linked to changes in water use efficiency of the plants that are ultimately controlled by the opening and closure of the stomatal pores which regulates gas exchange. For carbon isotopes to be used as an accurate and precise method to reconstruct CO2 the major requirement is to demonstrate that changes in CO2 are the main driver of changes in the carbon isotopes. This relationship needs to be independent of other environmental conditions that can affect the way plants use water such as temperature and specifically the amount of water availability. in many science fields. Copyright Wikipedia. In our experiment we used Arabidopsis thaliana (common name Thale cress), a small flowering plant native to Eurasia and Africa, where it is considered a weed as it readily colonises roadsides and disturbed land and has a short life cycle. 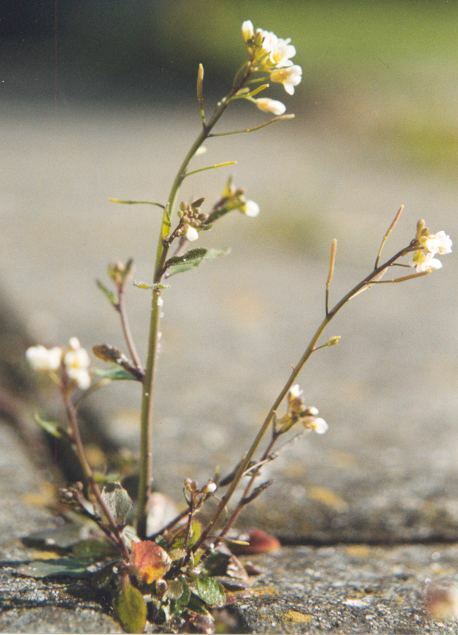 Thale cress has a relatively small genome, and it was the first plant to have its genome sequenced. It is used to understand molecular biology of many plant traits, including flower development and light sensing. Thale cress is an ideal experimental plant as its short life span allows for many experiments to be carried out within a short period of time. In our experiments, the Thale cress was exposed to different watering regimes (low, medium and saturated) and grown over a wide range of CO2 concentrations (from 380 to 3000ppm; the current amount of CO2 in the atmosphere is over 400ppm and climbing rapidly) relevant to conditions what plants would have been subjected to through plant evolution.